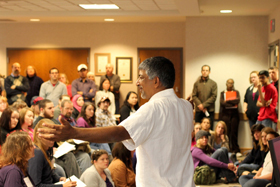 Indiana University East is hosting its first Interfaith Institute from 10 a.m. to 3:30 p.m. on Friday, April 20 in Vivian Auditorium, located in Whitewater Hall. The event is free and open to the public. Reservations may be made online at iue.edu/interfaith/institute-form.php. IU East Celebration for MLK Jr.
Indiana University East will hold its annual Martin Luther King Jr. Celebration at 1 p.m. on Thursday, January 21, in the Whitewater Hall Lobby. The event will feature speaker Phyllis Boanes, professor of history and past director of the African and African American Studies Program at Earlham College. Read more on IU East Celebration for MLK Jr…. Nearly 300 degrees will be conferred at the Indiana University East Commencement Ceremony on Friday, May 15. Commencement begins at 6 p.m. in the Tiernan Center at Richmond High School. IU President Michael A. McRobbie and IU East Chancellor Nasser H. Paydar will preside and address the 297 graduates eligible to receive degrees during the ceremony. The figures include degree recipients from December 2008 and candidates for May, June and August 2009.